Alpine Orthopedics of Bozeman, MT, a medical group with three orthopedists, one D.O. and five physician assistants, has selected ChartLogic’s EHR Suite. The medical group provides a wide range of services including sports medicine, back pain treatment, hand surgery and ACL reconstruction. The group’s clinic includes X-ray and MRI machines. eGistics, Inc., a provider of cloud-based document management solutions, has announced the availability of eGistics CloudDocs 5.0Electronic Document Management System, and the exciting new DocAudit feature, designed to identify missing or expiring documents and help with the challenges of compliance. QuadraMed® Corporation has announced Rock Springs, Wyo.-based Memorial Hospital of Sweetwater County will deploy its full suite of electronic health record and document management solutions as part of the facility’s readiness strategy for achieving Meaningful Use. A QuadraMed client since 2007, Memorial Hospital of Sweetwater County will add the company’s EHR offering, QuadraMed Computerized Patient Record (QCPR), and document management system, Quantim Electronic Document Management (QEDM), to the QuadraMed revenue cycle management technologies currently in place. DocuLex Inc has announced that it has achieved the ONC-ATCB Certification Seal for its Archive Studio WebSearch Document Management Software. The Seal represents that Archive Studio has been tested and certified for use by healthcare providers seeking to adopt and successfully demonstrate “Meaningful Use of Certified EHR Technology”, to qualify for incentive funds under the American Recovery and Reinvestment Act (ARRA). The Seal indicates that the DocuLex Software Suite has passed a series of tests to prove compliance with the EHR technical standard as required by the Department of Health and Human Services (HHS) Secretary. Black Book Rankings, well known internationally for accurate, impartial customer satisfaction surveys in the services and software industries, conducted a sweeping four month user poll to determine the highest ranked Electronic Health and Medical Record organizations for 2011. As part of a special research focus on several specialty physician EMR users, Black Book announced those vendors with the highest scores in customer experience in the areas of Document Management, Practice Administration and Revenue Cycle Management, E-Prescribing, and Accessibility. Multispecialty clinics were evaluated by criteria which defined them as having at least one primary care practice and four medical and/or surgical specialty practices within the same clinic administration. Multispecialty Clinics also required at least seven physicians or more to be included in this software user ranking. MED3OOO, headquartered in Pittsburgh PA, captured the 2011 top honors in customer experience and satisfaction among all EMR systems focusing on multispecialty clinics. Other top performers in the multispecialty clinic setting include: NextGen Healthcare, Allscripts, Dr. First/Rcopia, Sage, Epic Systems, LSS Data and Greenway Medical. ChartLogic, a leading provider of EHR solutions to surgical specialists, announced today that Mission Surgical Clinic, Inc. has selected the ChartLogic EHR Suite. The clinic, specializing in general, vascular, and minimally invasive surgery, includes four surgeons and one physician’s assistant and maintains three offices in Riverside County California. The clinic will adopt the ChartLogic EHR Suite including the ChartLogic EMR (electronic medical record), ChartLogic Document Management, ChartLogic ePrescribe, ChartLogic Patient Portal and ChartLogic Mobile Doc. With these tools, physicians in the medical group will be able to prescribe medications electronically, view images remotely with a PACS interface, improve coding accuracy with special surgical medicine templates and communicate with patients through a patient portal. According to Eric Leavitt, referral coordinator and IT manager for Mission Surgical Clinic, a dozen other EMR systems were evaluated before selecting ChartLogic. DBTech today announced that Greenwood Leflore Hospital of Greenwood, MS has successfully completed the first phase of converting paper forms to the DBTech RAS workflow and intelligent document management platform, and simplifying the process of exchanging patient information with the hospital’s EMR system. “Even before the concept of electronic medical records was on the drawing board DBTech was helping hospitals eliminate paper, improve patient safety and extract unnecessary administrative costs from hospital care,” said Philip N. Kaplan, CEO of DBTech. Greenwood Leflore serves six counties and is one of the largest hospitals in the region, with more than a dozen medical services and 18 outpatient satellite clinics. Since 2006, 10 departments and all patient care units have been relying on nearly 500 pre-printed forms for their business processes, often having to redesign the forms to suit their unique department needs. On average, the hospital generated nearly 100 sheets of paper per inpatient and 75 per outpatient, with an estimated cost of $39,000 a year for just one set of patient care forms. Greenwood Leflore implemented DBTech RAS e-Forms, which takes information from hospital department data sources and automatically generates pre-populated, bar-coded documents. Pre-printed forms, stacks of paper and multiple copies all go away. Moreover, transferring patient information from DBTech RAS e-Forms to the hospital’s EMR system is much simpler. Within two months, 483 documents used by 12 departments have been scanned and converted to DBTech RAS e-Forms where they can now be modified as needed, then bar-coded and stored in electronic patient folders. DBTech RAS captures, compresses and archives all scanned paper and electronic patient documents into a searchable database allowing users access to real-time, ad-hoc and archived information in report form. Greenwood Leflore has already calculated a savings of more than $145,000 annually using DBTech RAS e-Forms. DBTech has created a case study on the Greenwood Leflore implementation that is available here. Nason Hospital, a 45-bed community hospital located in Roaring Spring, Pa., is committed to improving patient care and service through the use of healthcare information technology. While implementing Siemens MedSeries 4 (MS4), administrators realized that the electronic medical records (EMR) system was not going to meet the needs of clinicians in certain departments of the hospital. In order to collect clinical data on the fly and instantly access it from patient charts, and to eliminate expensive multi-part, pre-printed forms, Nason was challenged to find a system that would meet these needs and integrate well with MedSeries 4. To solve these challenges, Brian P. Lilly, Director of Information Technology, and Deb McGraw, Vice President of Patient Care, selected Access Logical Ink (ALI) a tablet-based mobile e-forms solution from Access, the world’s leading provider of electronic (e-forms) management, automation and workflow software. Nason Hospital is transitioning to Siemens MedSeries 4 and Siemens Soarian Enterprise Document Management (EDM), which Access ALI integrates seamlessly with. Once a clinician completes a form on a tablet PC, they will simply click a button and the form will be auto-indexed with the correct patient’s electronic health record (EHR) in Soarian EDM. “Access ALI will help us in our efforts to become as paperless and efficient as possible,” Lilly said. A key to the success of any new healthcare IT project is the adoption of the system by clinicians. ALI is accessible from anywhere in the facility, using a familiar pen-based interface. A clinician can simply select the patient, choose the form type – such as progress note or questionnaire – and complete it using the tablet’s stylus. ALI can pull in data from previous clinical documents to speed form completion and help ensure care continuity. Entering information on Access ALI forms mirrors the existing process, and an intuitive interface makes it quicker for clinicians to use this technology. ALI will also provide updated patient information the moment a form is completed, which will be a big improvement over going to the health information management (HIM) department to pull charts. C Cube Solutions and Kodak today announce that Merseyside-based St Helens & Knowsley Teaching Hospitals NHS Trust has won the healthcare IT category at the 2010 Health Business Awards. The Trust won because of a unique project to install an electronic medical records (EMR) system so that patients coming into hospital are seen by clinicians and health professionals who have their complete medical history available immediately on a computer. The system improves services and guarantees the quality and safety of patient care. As far as is known, this makes The Trust the first in the NHS to stop using paper health records in operational practice. Held at the Arsenal Emirates Stadium last week, and hosted by BBC Breakfast presenter, Bill Turnbull, the Awards – run by Health Business magazine – recognise excellence in the provision of NHS facilities. Following a 22-month roll out, this landmark project has been hugely successful and readily accepted by over 500 doctors and 130 medical secretaries who use the system day-to-day. Consultation is underway to extend it to the Trust’s whole health economy over time. Working with partners, C Cube Solutions and Kodak, the Trust has delivered an innovative way of converting its whole paper health record stock using a scan-on-demand approach, with an electronic document management system and custom-built portal then used by clinicians to access these records whether it be in outpatient clinics, wards or operating theatres. This means guaranteed availability of the right patient file to the right doctor at the right time. The impact is huge – the quality of patient care is enhanced, safety ensured, organisational efficiency improved and costs slashed. Historically, the Trust was in effect running an internal logistics business ferrying files to and from its medical library to clinics and wards which was unsustainable and inefficient given the vast quantity of patients seen annually. It was just not practicable to shift 7,000 medical files every week for patients attending hospitals on different sites. This is the third award the Trust has received this year regarding the project having won the public sector IT project of the year categories at both the UK IT Industry Awards and the Document Management Awards 2010. The system utilises a customised and bespoke built version of C Cube Solutions’ EDMS, with Kodak high performance i660 and i780 document scanners used to digitise paper files and cope with the substantial scanning volumes required. 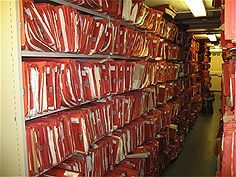 To date, 41.3 million pages have been scanned equating to around 134,389 medical records. Doctors throughout the NHS often have to make decisions about patient care without necessarily having all their background history available which obviously represents a safety issue. If the Trust has seen a patient previously, it can now offer the right treatment based on past medical history as all their details are instantly available on screen. In other words, the system allows doctors to make better and more informed decisions about the appropriate care for patients, and ensures that patients – for example – don’t have to be admitted for exploratory tests because notes were not immediately available. Communication with patients and their families is enhanced, with clinicians able to access the system via secure VPN links which improves team working and productivity. With the sponsorship of the Trust’s CEO, Ann Marr, the system was created by the Trust’s informatics service led by the director of informatics, Neil Darvill, and in close partnership with C Cube Solutions. It cost £1.2 million. While the primary driver behind the project was patient safety and care, operational costs will substantially reduce with the Trust expecting to save of £1.4 million annually by closing its traditional paper library, redeploying staff and avoiding the transportation costs associated with delivering files. MxSecure, the nation’s leading provider of medical transcription services and clinical documentation software to solo practitioners, physician practices and community health centers, announced today the addition of new features and functionality to its electronic health record (EHR) solution, MxChart™. First released in June 2010, MxChart is an affordable, easy-to-operate electronic health record solution that runs on a flexible web-based EHR platform. Developed to be the closest thing to a traditional paper experience, MxChart works with other clinical systems and is highly-customizable to ensure that physicians can work the way they want. Additionally, the web-based system is accessible from multiple locations and mobile devices, such as an iPad, so whether in the office, at home or on the road, physicians can access patient information anytime, anywhere.